Causing engines worn out gears to strip. Not possible to be fixed with some paper clips. Spock's advice to Kirk! "Abandon ship." Gorn licks Captain; smacks lips. 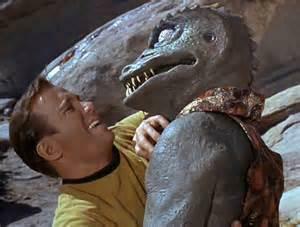 Kirk fights alien Gorn whose tongue flicks. Mister Spock saves the day, tazer zips. This is a "Pat's spaceship poem" patterned on Patricia's (patcelaw) form she invented. Syllables are: 1-3-6-9-12-9-6-3-1. When centered, the lines take the form of a spaceship--so I wrote my poem about space. Thank you for reading my poetry and thank you, Patricia. © Copyright 2019. BeasPeas All rights reserved. BeasPeas has granted FanStory.com, its affiliates and its syndicates non-exclusive rights to display this work.